Every month, around 2 million people in the U.S. move to a new home. Once they move, they start searching for banks, dentists, shops and other places of business in their new neighborhoods. 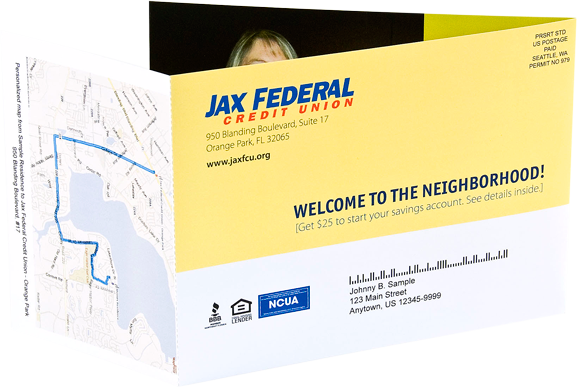 Help them find you first with New Neighbor Mailings. 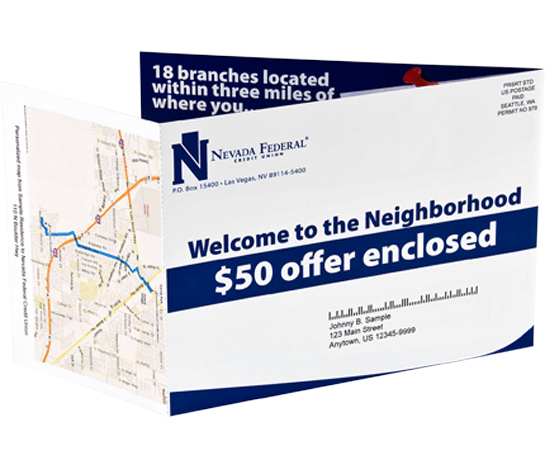 These mailings include personalized maps so your mail stands out in the mailbox, resulting in higher response rates and more foot traffic. We’ve already set up the templates too. Your designer just fills in the blanks. And it’s completely automated. Set it up and let it go, telling newcomers about you…without you doing a thing. Completely automated, New Neighbor Mailings couldn’t be simpler. 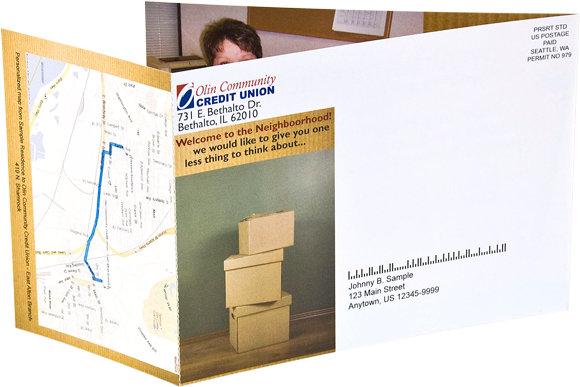 The mailer is designed with your own branding and messaging, using templates to speed up production. On the 1st of each month, we collect the data of everyone who’s recently moved into the neighborhood. On the 15th, we send your customized mailer to these highly targeted prospects and include a map personalized just for them. There are no set-up fees, program fees or hidden costs. You only pay for the pieces that get mailed each month. This is a pay-as-you-go program. You can start mailing as soon as next month, and you’re free to cancel or suspend the program at any time. 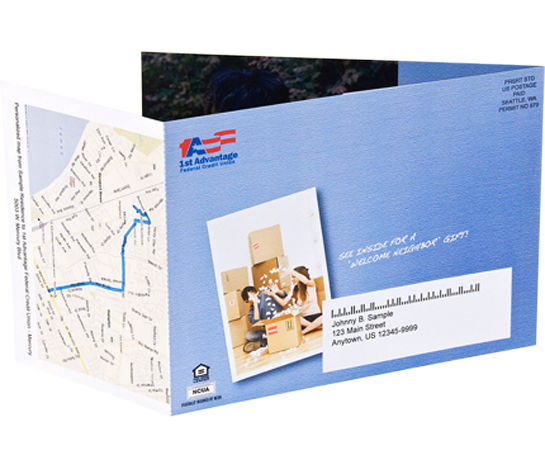 Large high-quality self-mailers that fold to 6-3/4" X 5"
Can I design my own layout and have you print a personalized map on it? 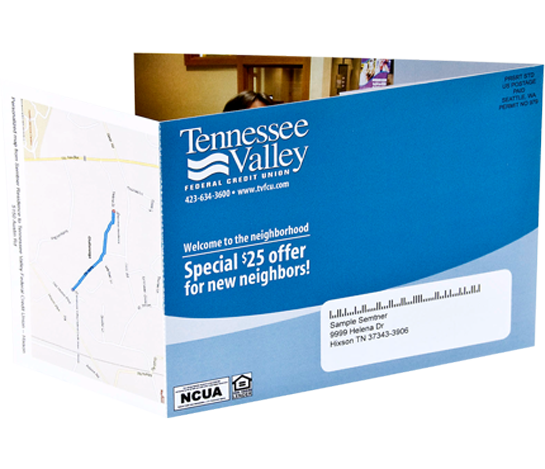 The New Neighbor Mail program always uses the self-mailer format. Please download the free template here. Will I have a chance to proof or press check the mail piece before it goes out? Yes, we will post a proof online in about 2 days for your review. Payment is made by credit card. Your credit card information is entered on the website and is securely stored for the monthly billing. Where do these lists come from, and how current are they? For the ongoing monthly programs, we purchase mailing list data from Epsilon Data Services (www.Epsilon.com). As a New Mover data COMPILER, they claim to have the world's most extensive and accurate databases. Will I be credited if there are any non-deliverable addresses? As with any 3rd Party mail lists, there will be some un-deliverable mail pieces. We take extra steps to scrub our lists by putting the data through the CASS and NCOA processes. Un-delivered mail is destroyed by the Post Office and there is not a refund. Do I have to use the same artwork every month? No, you can change the design as often as you like. But you have to have your final artwork to us by the 25th of the month for us to mail by the 15th. Absolutely. The plant used to manufacture and mail the New Neighbor Mailings is a leader in environmental stewardship. 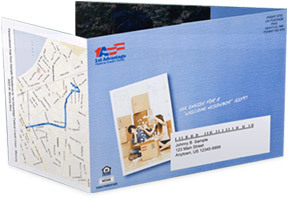 They are FSC-certified, use recycled paper stocks, and are even wind-powered! Can your designer create my self mailer? Yes, please work with your representative to find the best way to create your artwork for the mailings. What will my quantities be if I choose a monthly program? A rough answer is 50 to 300 pieces per location per month within a 3-mile radius. This quantity is seasonal and often erratic, so each month will be different. Why is payment due so quickly on monthly programs? A quick mailing to the New Mover market is vital! 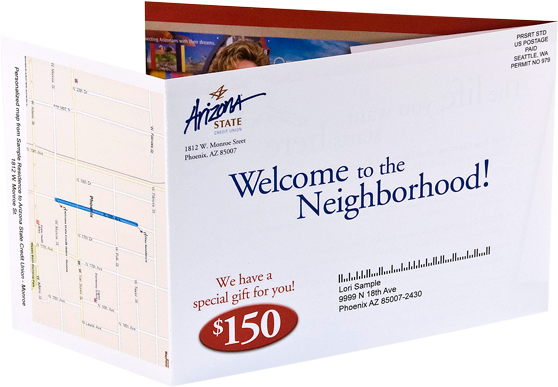 We want your direct mail piece to arrive within the first month of the prospect moving into your neighborhood. Your payment allows us to purchase the data, go on press and pay for U.S. postage – all by the 15th of each month. Can I have a copy of the data list used? No, the data list of the monthly programs is rented for a one-time use only. How will I know the mail piece has been delivered? 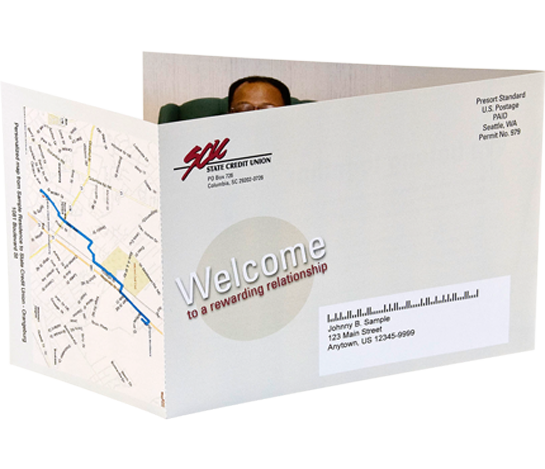 A ”seed” will be included for each mailing, so that the self mailer be will be received at your location around the same day your new prospects or customers receive it.